Managing product stock, especially out of stock product is one of the biggest concerns for store owners. If customers have the interest in a product, but it is out of stock, store owners risk losing potential customers to their competitor? Magento 2 Out of Stock Notification extension will solve the problem by allowing customers to subscribe for the out of stock item through an email subscription box. 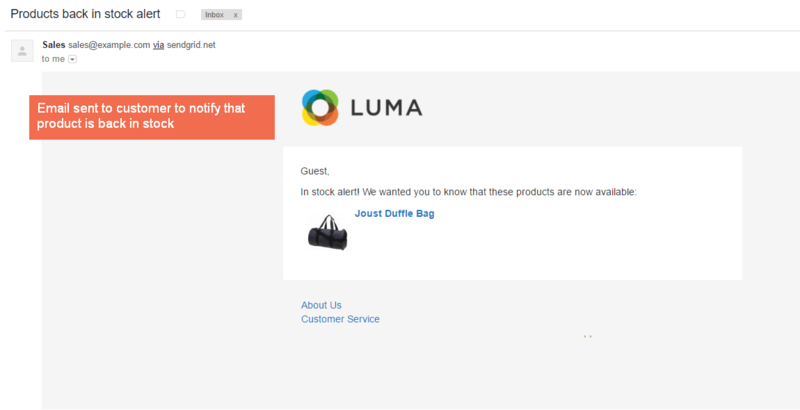 When the product is back in stock, a stock alert email will be automatically sent to the customer. Does Magento 2 Support Stock Alert by Default? The function product alert is supported by Magento 2 default, but it is limited. Only logged-in customers can subscribe to the stock alert. This will be a significant disadvantage for visitors or not-logged-in customers because they won’t be able to get the stock notification for the out of stock product. Moreover, the default stock subscription doesn’t apply for children product of configurable product, grouped product and bundle product. 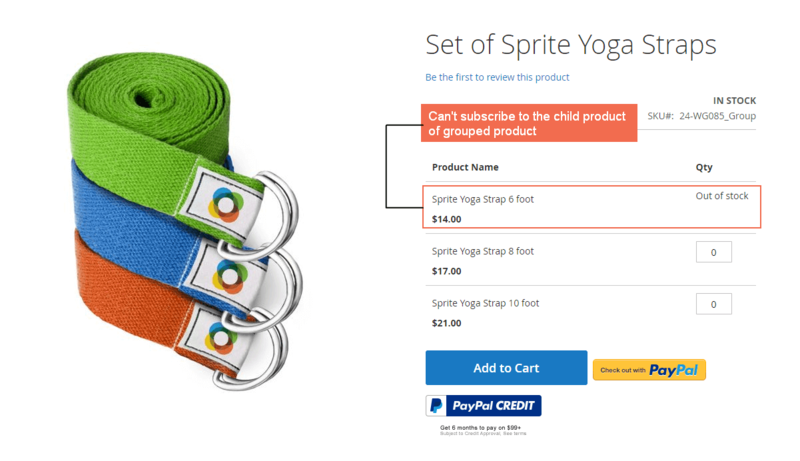 For example, customers cannot subscribe to a stock alert for the yoga strap 6-foot item of in the grouped product yoga strap. To override the limitations of Magento 2 default, BSSCommerce proudly introduces to you Magento 2 Out of Stock Notification extension as an effective way to enable stock subscription for the not-logged-in customer or any customer groups as wish. The extension also supports out of stock notification for all product types, even the child product of configurable, grouped and bundle product. With this Out of Stock for Magento 2 extension, customers can get the earliest information on their desired product through notification email sent when a product is back in stock. Store owners can understand customer preference easier and increase customer loyalty. 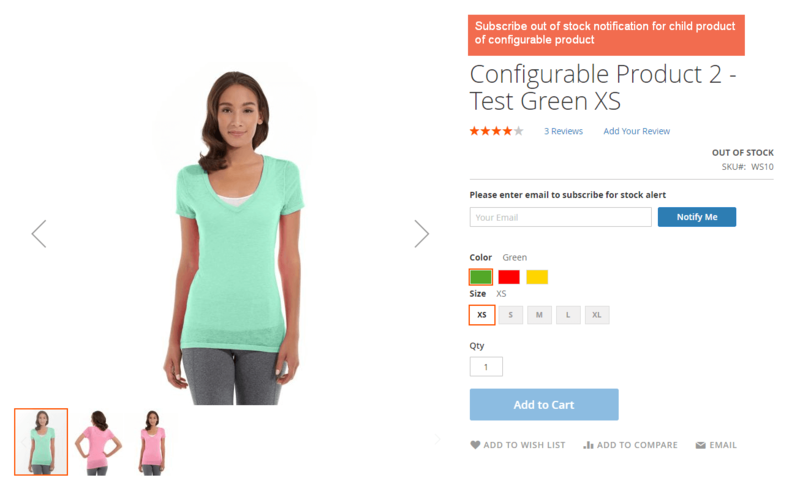 How Does Magento 2 Out of Stock Notification Extension Work? Product stock alert can be set for any customer group including not-logged-in, general, wholesale and retailer customer groups. Therefore, guests or visitors can also sign up for out of stock notification, unlike the Magento 2 default that only enables this function for logged-in customers. For customers who signed up for product stock alert, Magento 2 Out of Stock Notification extension will automatically send an email notification to them when the item is back in stock. The extension has some advanced function to limit the number of email sent to customers and restrict to send a stock alert email only when the product quantity reaches a certain figure. The out of stock notification feature is compatible with all product types, including simple product, configurable product, bundle product, grouped product. More especially, the extension also supports stock alert function for children product of configurable, grouped and bundle product. An additional tab named My Product Subscription is included in Customer Account Page. 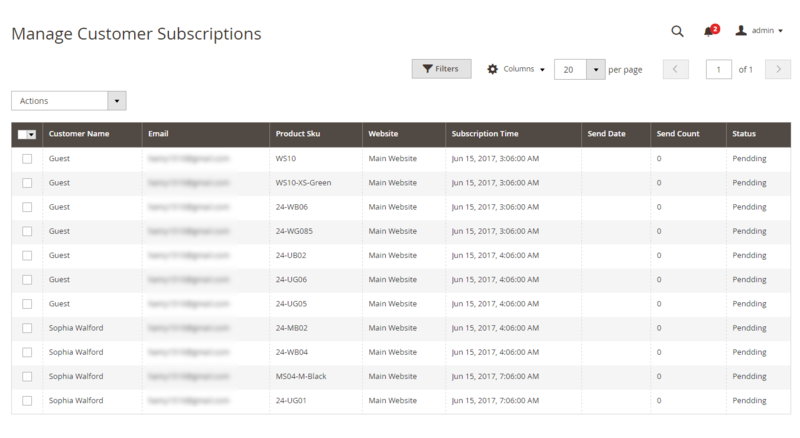 Customers can easily check product subscription information or stop notification for any product here. Magento 2 Out of Stock Notification extension allows admin to manage the list of customers subscribes to stock alert along. Admin can check all information in a convenient grid, such as customer email, product name and number of times the stock alert email has been sent. Admin can easily configure the stock alert email. Some exciting functions are email template, email sender, and limitation on the number of email sent per customer. Magento 2 Out of Stock Notification extension can satisfy the diversified requirement of setting a stock alert for any site. Your customer will highly appreciate your professional service, and you can have a better understanding of customer preference and identify high-demand items to refill stock quickly.